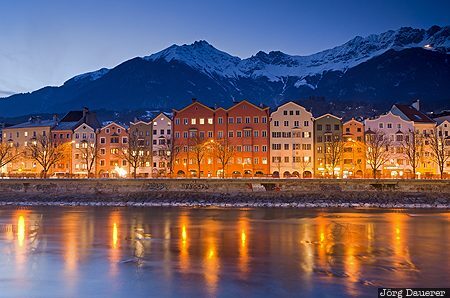 Houses of Innsbruck illuminated by street lamps reflected in the Inn river in front of the snow covered mountain chain Nordkette (or Inntalkette) at the blue hour after sunset. Innsbruck is the capitol of Tyrol (Tirol), Austria. This photo was taken in the evening of a sunny day in February of 2011. This photo is in the Photo Calendar "Alps". This photo was taken with a digital camera.